Mother-daughter duo Theresa and Carly Williams assist during the grand opening of St. Yared Ethiopian Cuisine & Global Village Coffee. Many Geist residents are anxious to visit the new Ethiopian restaurant called St. Yared Ethiopian Cuisine off Fall Creek Road near the roundabout at Brooks School Road, just a few doors down from Holy Spirit at Geist Church. This restaurant, named after the 5th century Ethiopian priest who composed both the chant and dance for the Ethiopian Orthodox Church just recently opened its doors. The interior has a dining area, a full bar serving alcohol, and a coffee bar specializing in Ethiopian coffee and well as others from the great coffee growing regions of the world. “We are truly excited about sharing the eon-aged taste, traditions and cultural bounty of Ethiopia with you our fellow Americans; it is part of our give back to America mission,” says Haile Abebe, owner of St. Yared. Upon walking in the door, you see exotic pieces of art spread throughout the entire restaurant. You can feel the vibes stemming from the bright colors and styles within the decor bringing forth the more than 3,000 years old Ethiopian culture to life. “The food is amazing! It is so different than anything else I’ve ever tasted,” says Carly Williams, waitress at St. Yared who also coaches soccer. 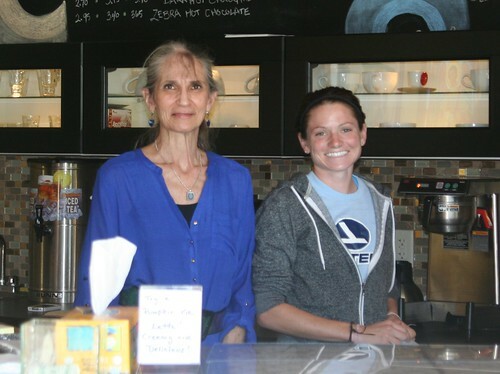 Carly and her mother, Theresa Williams, have helped with the Grand Opening. Theresa adds, “The bread is unbelievably good. It’s made here fresh every day.” Some marvel about the actual dining experience. “Dining at this table tonight fostered a new sense of community and sharing,” says Wade Brown, resident of Geist and Roche colleague. St. Yared is located at 11210 Fall Creek Road. To give you a sneak preview, the dining experience in Ethiopia is characterized by a ritual breaking of the Injera, or bread and eating from the same plate in order to signify the bonds of loyalty and friendship. Further, these bonds are shown in the form of mukulas or gursha which translates to the placing of food in the mouth of a loved one or friend from one’s own hand. This gesture serves as an expression of love, affection, and friendship toward a fellow diner. The St. Yared Injera is made from Teff (Teff is like coffee and sesame seed, a grain native to Ethiopia) and self-rising wheat flour. It is this pancake-like bread from which various stew dishes are served. All of the cuisine prepared at St. Yared is free of artificial colorings, artificial flavorings and artificial preservatives. “This place looks like a museum with all the pictures and furnishings,” says Adam Brent, a 20 year old student at Ivy Tech. Others have dubbed it as a “gem” in the heart of Geist. In addition to the dining area, there are two private rooms and one large party room for conferences, parties and special events such as for parents who have adopted children from Ethiopia. In the near future, St. Yared will begin serving breakfast and lunch and also feature folk musicians playing ancient Ethiopian music. For weekend dining preferences, reservations are strongly suggested. To make a reservation, please call 317-989-8326. St. Yared Cuisine is open every day from 3:00 pm-9:00 pm except Mondays when it is closed. Global Village Coffee opens every day from 6:15am-9:00pm except on Mondays when they are open from 6:15-2:00pm. 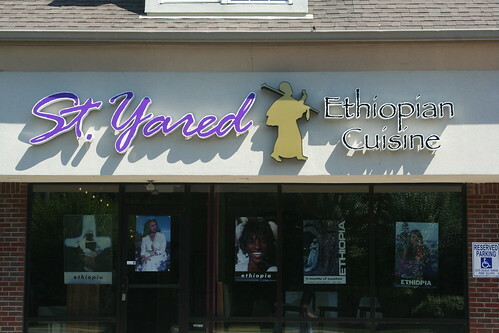 St. Yared is located at 11210 Fall Creek Road; the website is currently under construction. Janet C. Striebel is a Fishers resident and freelance writer. She and her husband, Doug, have three children: Ryan, Jessica and Justin. She has been writing for atGeist.com for more than seven years and claims that the best part is meeting all the interesting people in her community.